Cleanse your body and detox are core principle of healthy body and mind . Detox = Resting+ Cleansing +Nourishing the body, from the inside out. Cleanse and detoxification of body need changes in lifestyle to clear toxins from body . Humans have natural ability to detoxify and cleanse itself. Excretory system consist of liver,large intestine, lungs, the skin and kidneys plays essential role in detoxification . Liver’s job = Filter and excrete waste ,drugs and other foreign particles. Large intestine’s job = Absorbs water and nutrients from food. Lung’s job = Removal of carbon dioxide . Skin’s job = Aids in elimination of toxins through the sweat glands . 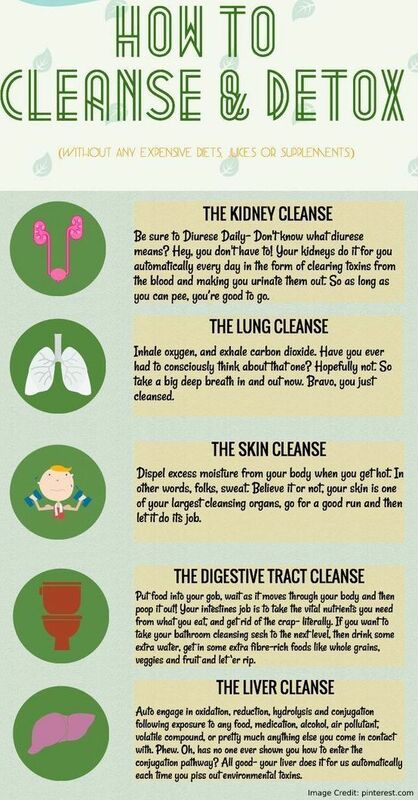 Checkout the infographic by PINTEREST showing How to cleanse and detox Your Body. Diny R is a director of research and development for women health issues, pregnancy fitness. She has been credited with major advancements in her industry and is a respected member of her field. In recent years Diny R has focused her energy on educating women about the pregnancy related issues.